I got involved with Microsoft quite early. 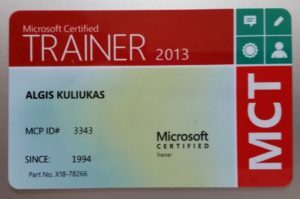 My MCP (Microsoft Certified Professional) ID is 3343, so only just over 3,000 people got accredited before I did. I’ve always been a fan of Microsoft. Their software was always focused on ease-of-use and allowing all of their products to work together with an elegant synergy. 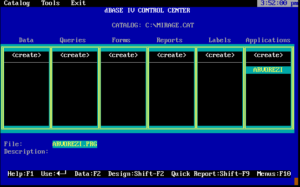 When I worked at Ashton Tate, they had a database (dBase IV), a spreadsheet (Framework III), a Word Processor (MultiMate), and a graphics package (Draw Applause). They were a bit like Microsoft’s Office suit is today, but they all worked completely differently, even to the extent of having different keystrokes to invoke a menu. If anyone had introduced me to the concept of copying and pasting from one application to another, or a common look and feel across all these packages, it would have seemed like something Doc Brown might have shown you after speeding off into the future in his DeLorean. But of course, what was about to happen to the PC software market around the late 80s/early 90s wasn’t science fiction. 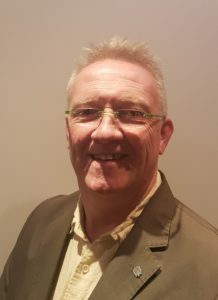 dBase IV was the strong market leader of the PC databases in those days (around 1988) and it was therefore natural that Ashton Tate would be the first PC database company to get involved with bigger, more “serious” database companies like Sybase to promote a the concept of “client/server” computing. Sybase wanted to port their high end, robust database, SQL Server onto a PC (in the early days, IBM’s OS/2) platform and Ashton-Tate wanted dBase to be able to act as a front end to that data. dBase had a rich development environment with a decent programming language with graphical forms and reporting tools but it was clumsily lacking in several areas. Creating a one-many form was something we’d only start to cover on the last day of the advanced course, for example. It had no proper implementation of a primary key and no SQL support. In fact there were seven or eight competing packages that all had similar strengths and weaknesses. Paradox, DataEase, R-Base and Superbase are a just four of the more memorable ones. DataEase were also pioneers of the client/server model. It was a situation waiting for Microsoft to step in. Just like Word completely took over from WordPerfect, Excel from Lotus 1-2-3 and PowerPoint from its predecessors, the database market was ripe for the picking. 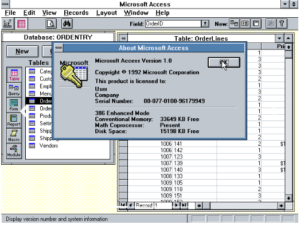 When the then UK product manager, Nigel Stanley, showed me Microsoft Access for the first time, in late 1992, at a coffee break in a SQL Server course I was giving at the time, at Microsoft’s office in the UK in Winnersh – I was blown away in ten minutes. It was like looking into the future. I was sold 100% straight away. So much so, that Nigel asked me to write the course materials for version 1.0 as the US team were behind schedule on that project. A package arrived for me on 28th September 1992, as my wife and I were heading to the maternity hospital for the birth of our 3rd child. After witnessing another wonderful successful birth I headed home and opened up the package and started to learn the product. I’ve been using the product pretty much every day since. 26 years later, I still think Microsoft provides the best software platform for the desktop and, with Access, they still have the most productive database development tool around. It seems to me that between Microsoft Excel, a beautifully rich data tool in its own right, and the .Net platform there has to be something to fill that gap. Excel power-users can come up with complex formulae and VBA coded macros to do all sorts of clever algorithms with their data – but it’s not a database. Excel has no Primary Key and no elegant way of linking tables of data. It’s not multi-user. It’s just not a good place to store your data. At the other end of the spectrum, Microsoft SQL Server is a superb database product with the richest and most cost-effective tool set available, but it has no easy-to-use development tools. Sure, there’s Report Writing Services but where’s the simple data entry form-builder? There isn’t one. You are encouraged to develop those with the .Net Framework. Now, .Net is also a beautifully rich and well-designed tool but you have to be a specialist even to get started with it. It’s been on my “to do” list for years but every time I make a start, I am quickly reminded how tedious and unnecessarily complex it is to do the most basic data entry form with a bit of smart code behind it. This is where Microsoft Access is in its element. In one click of a button, you can create a pretty functional data entry form onto which you can add smart VBA code snippets to do whatever is required. It’s as easy to use as Excel and as safe and robust as SQL Server if you decide to upsize your tables there. It’s a proper database in its own right, if you decide you don’t need such a robust database. For 10-15 users it’s adequate as a multi-user database too. My hope is that Microsoft realise what a great product they have soon, reverse their trend of dumbing it down and actually invest in some long-overdue development tools to bring it back to where it was in 2003 – a real alternative to SQL Server/.Net development. Too much database work makes a dull boy and I do have some other interests. As I am the son of Lithuanian and Romanian refugees I’ve always been interested in politics and Eastern European culture. I’ve always been a bit of a football fanatic and for twenty years or so I’ve been getting back into science in the field of anthropology and human evolution. Since my interest in human evolution was rekindled by my eight-year old son on bonfire night, 1995, I have been a keen proponent of the so-called (but mislabeled in my opinion) “Aquatic Ape Hypothesis”. I returned to academia, did a Master’s Degree at UCL and then a PhD at UWA basically on the origin of human bipedalism. I have a waterside hypothesis of human evolution which I call “River Apes … Coastal People.” I have a couple of web sites and blogs on the subject. I’m also currently writing a nostalgic blog about Nottingham Forest’s amazing success 40 years ago (1977-1981). The 40th anniversary of every match is celebrated with a write up which take the reader down memory lane to a time when football wasn’t quite so greedy and dominated by the richest clubs.